Art: Jesie Pace-Berkeley - Blacksburg; PH=A - LA & New York; Lee Farley - Danville; Wayne Dobson - Danville; Sourthern Virginia Artisan Center - Martinsville. Fashion: Martinsville Fashion Team; Rocky MT Fashion Team. Photography: Nathan Brown - Nashville; Graham Park - Martinsville; Cathy Farley - Danville; Photo Glimmers; Last Shot. Film - Television - Stage: On Lake Effects Film Producer Sara Elizabeth Timmins; Making An Independent Film By Steve Cole; Will Hollywood TV & Film Makeup & Hair Artists Be Needed In The Future? By Iris Gillispie; Music On Stage: Eric Baker - Poetry Set To Music By Johnny Price. 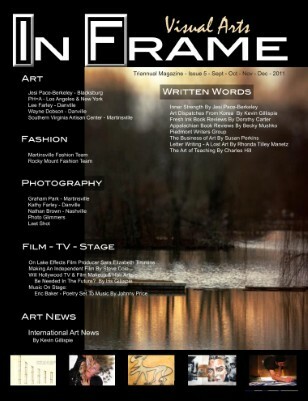 International Art News: By Kevin Gillispie. Written Words: Inner Strength By Jesi Pace-Berkeley; Fresh Ink Book Reviews By Dorothy Carter; Art Dispatches From Korea By Kevin Gillispie; Appalachian Book Reviews By Becky Mushko; Piedmont Writers Group; The Business of Art By Susan Perkins; Letter Writing - A Lost Art By Rhonda Tilley Manetz; The Art of Teaching By Charles Hill.